There are four features of a diamond that determine the price: cut, color, clarity, and carat weight. The cut of your diamond typically has the biggest impact on its price--about 25% to 50%. Carat weight will influence about 10% to 20% and color and clarity each make up the last 10% to 15% of the price. Some people just want a big rock, but if you're looking for value, carat weight is the last feature you should consider. Get the highest quality you can afford. How a diamond is cut directly affects its brilliance or sparkle. And the sparkle is why you're buying a diamond. If you're going to splurge on one of the four C's, do so on the cut. A smaller-carat diamond can look bigger if it's cut well. Try to purchase the highest cut grade within your budget, trading down on color and clarity if needed. 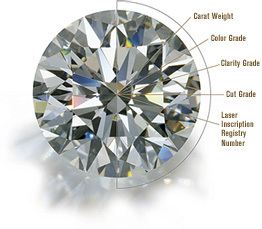 Flaws in the diamond, such as minerals or laser lines (from when the diamond is cut), are called "inclusions." Consider an "eye-clean" diamond, meaning it appears flawless to the naked eye. Buying either a "very, very slightly included" (VVSI) or "very slightly included" (VSI) diamond will cost less, and many of them look just as pretty. Some people prefer diamonds with inclusions, because they're more personal. Diamonds are a material which is formed naturally, some have little imperfections. Once you've determined how much you're willing to spend on the first three C's, you can determine what carat weight fits your budget and quality criteria. Larger carat-weight diamonds are rarer, so as they grow in size, they rise in price exponentially.